Call Us at (02) 403-3262 / (02) 668-9668. For Globe Mobile call 0916-311-3909. Telefax at (02) 893-1373. Email at inquiry@dswindows.com. 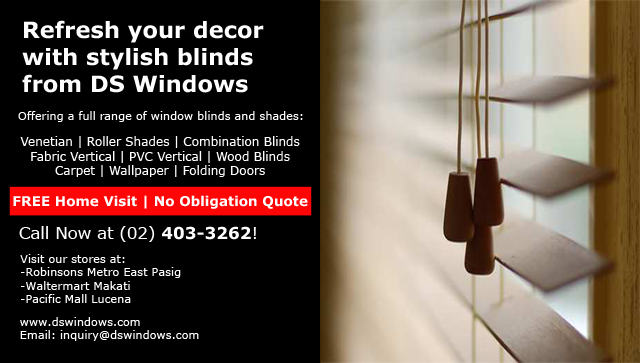 DS Windows and Walls is a service-oriented company ready to serve you anytime. With our more than 10 yrs experience, success and quality service are guaranteed. We install at residences, buildings, offices, hospitals and other commercial and residential establishments. DS Windows and Walls is a supplier of Window Blinds, Vertical Blinds, Roller Blinds, Venetian Blinds, Durawood Blinds, Carpet, Carpet Tiles, Wallpaper, PVC Folding Doors. Main office (Manila) Room 401-A 4th Flr., M.G. Bldg., Amorsolo St., Legaspi Village, Makati City. 4th Level Waltermart (Makati) Arnaiz (Pasay Road), cor. Chino Roces Ave. (Pasong Tamo), Makati City – (02) – 403-3262 / (02) 668-9668 / (02) – 893-1373. 3rd Level Robinsons Metro East, Marcos Highway, Pasig City. Batangas, Cavite and Laguna – Globe 0917-583-0214 or Sun 0922-592-6111 or 0908-989-4676 – look for Patrick Villapando.